Armament: originally two 3-inch/50 caliber guns; eight 20mm anti-aircraft guns; presently one 3-inch/50 caliber gun; one 5-inch/38 caliber gun; eight 20mm anti-aircraft guns. One of two surviving Liberty ships preserved in the United States, Jeremiah O'Brien is the last un-altered Liberty. The ship is a product of an emergency shipbuilding program of World War II that resulted in the construction of more than 2,700 Liberty ships. Designed as cheap and quickly built simple cargo steamers, the Liberty ships formed the backbone of a massive sealift of troops, arms, material, and ordnance to every theater of the war. Jeremiah O'Brien made wartime voyages between the east coast, Canada, and the United Kingdom, to South America, Australia, and the Philippines. From June until December 1944, O'Brien made 11 trips between the United Kingdom and Normandy in support of the D-Day invasion, including a trip from Belfast, Ireland to Normandy with troops from Patton's Fifth Division. Laid up in the National Defense Reserve Fleet in Suisun Bay in California, O'Brien was set aside by the United States Maritime Administration in 1966 as the Liberty to be saved for future preservation. The ship was taken out of mothballs in 1979 and restored to operating condition. She is open to the public 359 days a year at Pier 45 in the heart of Fisherman's Wharf as a museum vessel, and makes memorial cruises monthly from March to October. She operates her triple expansion steam engines dockside the third weekend of November-February. 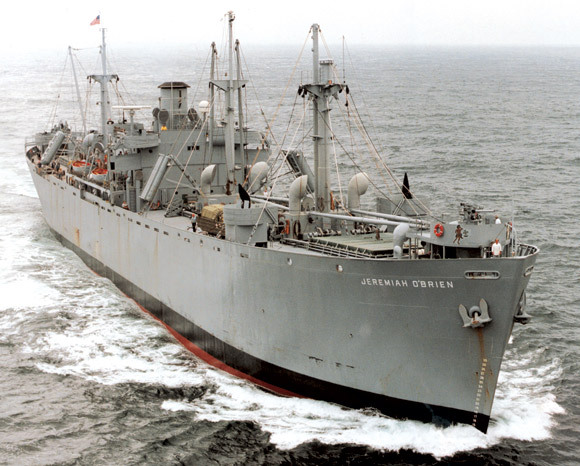 In 1994, Jeremiah O'Brien gained world attention when she steamed back to the Normandy invasion beaches to participate in ceremonies marking the 50th anniversary of D-Day -- the only U.S. veteran D-Day ship present. SS Jeremiah O'Brien is a National Historic Landmark and an American Society of Mechanical Engineers Historic Engineering Landmark.